Born in Philadelphia in 1921, Ralph Shapey showed early talent as a violinist. He developed as a conductor during his teens, and was appointed the Youth Conductor of the Philadelphia National Youth Administration Symphony Orchestra when he was seventeen. However, at the age of nine, he was trying his hand at composition, and by his twenties, he was composing seriously. 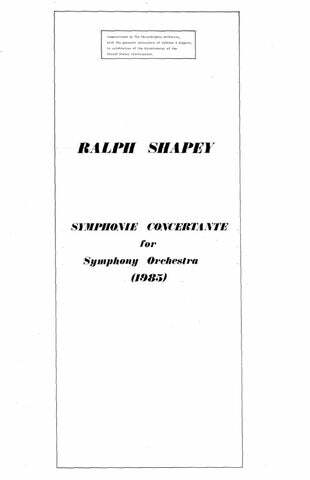 In his conducting career, Ralph Shapey led many ensembles, including the Chicago Symphony Orchestra, the Philadelphia Orchestra, the Jerusalem Symphony, the London Symphony Orchestra, and the London Sinfonietta, with whom he recorded his Rituals for Orchestra. Well-known as a conductor, he was the founder and music director of the Contemporary Chamber Players of the University of Chicago, a group that celebrated its 25th anniversary in 1989. Under Shapey’s leadership, the Contemporary Chamber Players became a highly respected group, establishing a reputation for excellence in their commitment to the presentation of new music. Shapey firmly believed in giving all styles of music a chance to be heard, regardless of personal taste. While having once served on the music faculty of the University of Pennsylvania, it was his many celebrated years as Professor of Music at the University of Chicago where Shapey’s work as a teacher had its greatest impact. In a career which encompassed composition, conducting, and teaching, Ralph Shapey received numerous awards and commissions. He was Distinguished Professor of Music at Queens College in New York City in 1985. He was the recipient of a MacArthur Prize from the John D. and Catherine T. MacArthur Foundation (1982); the First Prize in the Kennedy Center Friedheim Competition (1990, for Concerto for Cello, Piano and String Orchestra); the Paul Fromm Award in 1993; a commission from the Philadelphia Orchestra for the bicentennial of the Constitution in 1987 (Symphonie Concertante); a commission from the Chicago Symphony Orchestra for a work to mark the centennials of both the orchestra and the University of Chicago, which was premiered in 1991 (Concerto Fantastique); and two commissions from the Library of Congress. He was elected in 1989 to the American Academy of Arts and Letters, and in 1994 to the American Academy of Arts and Sciences. In 1991, he retired from the University of Chicago, Professor Emeritus. 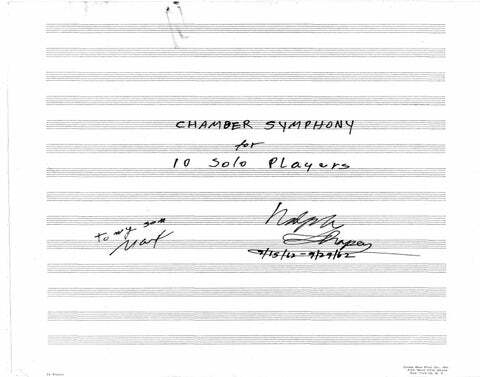 Ralph Shapey died June 13, 2002.
for 10 Solo Players 11:00 Fl. Ob. E.H. Hn. Tpt. Perc. Pno. Vln. Vcl. Cb. 11:30 Cl. Solo; Hn. Perc. Pno. Vln. Vcl. 22:00 Cl. Vcl. Elec.Gtr. Cb. Perc. Cel. for Solo Double Bass and Instruments 14:45 Solo Cb. ; Picc./Fl. Ob./E.H. Cl./Bsn. Cl./A.Sax. Hn. Vln. for Flute, Clarinet, Violin, Cello, Piano and Chamber Orchestra 2026 Fl. Cl. Vln. Vcl. Pno. Soli; 0 1 0 1 – 1 0 0 0; 2Perc. Str. 20:00 Solo Vln. ; 1 1 1 1 – 1 1 1 0; 2Perc. Vln. Vla. Vcl. Cb. 25:00 Solo Vcl. ; 2 2 2 2 – 1 1 1 0; 2Perc. Vln. Vla. Cb. 13:00 Solo Vln. ; 0 1 1 1 – 1 1 1 0; Perc. Vcl. 17:10 1(Picc.) 1 1 1 – 1 1 1(B.Tbn.) 0; 2Perc. Vln. Vcl. Pno. 14:00 Fl. Cl. Vln./Vla. Vcl. Pno. Perc. 17:30 Solo Vla. ; Vln. Vla. Vcl. Picc.(B.Fl.) EbCl. BbCl. B.Cl. Perc. Pno. for Orchestra 15:00 4 4 4 4 – 4 3 3 1; Timp. Perc. Pno. Str. for Orchestra 20:00 4 2 3 2 – 3 2 1 1; 9Perc. Pno. Str. for Orchestra 13:00 3 3 3 3 3Sax. – 3 2 2 1; 8Perc. Pno. Str. 7:30 Solo Tpt. ; Fl.(Picc. GFl.) Ob.(E.H.) Cl.(EbCl./B.Cl.) Bsn. Hn. Perc. Vln. Vla. Vcl. Cb. 54:00 2(Picc.) 3(E.H.) 3(Picc./Cl. in D/EbCl.) 3 – 4 4 5 1;Timp. Perc. Pno. Cel. Str. 25:30 Vcl., Pno. soli, Str. 23:00 Solo Vln. ; 2 2 2 2 – 3 2 2 1; 3Perc. Pno. Gtr. Str. 28:45 3 2 3 3 – 3 3 4 1; 2Timp. 6Perc. Pno. Cel. Str. for Soprano and 14 Instruments 20:00 Fl. Ob. T.Sax. Hn. Tpt. Pno. 7Perc. Cb. for Soprano and 10 Instruments 17:00 A.Sax. Hn. Tpt. 2Perc. Pno. Vcl. His body of works speaks for itself. Ralph Shapey is a unique American composer. …His integrity and dedication to the art of composition know few equals. …a towering master, a composer of flinty, astringent and utterly original works. Ralph Shapey is one of the strongest personalities and most individual figures in American music. Ralph Shapey’s Brass Quintet of 1963 stimulated with its powerful, dissonant blocks of sound and ritualistic repetitions. …an aggressive and big-boned ensemble piece which swept by quickly and ended on a gentle note featuring trumpet and vibraphone. Independent voice wove dense, dark textures which were pierced by the silvery protestations of the trumpet. A typically Shapeyesque sense of heroic striving pervaded the 10-minute piece, which ended with a calming epilogue for trumpet and vibraphone. …the highlight of Friday’s strong program… It was a dramatic work full of declamatory outbursts and long-held tones that swelled and faded atmospherically… The short, final section evoked the haunted beauty of a wakeful night. …vibrant, unsettling and moving… Shapey has grabbed the heritage of the concerto form by the collar and made it march in step with his own vision. …a magnificent work — epic in its scope, arrestingly original in its utterance, alive with interest and expression… great music by any standard I know. Shapey’s work, which was conducted by the composer, was the most profound and expressive work of the evening. The composer-conductor was brought back six times by the appreciative audience. The Shapey is extreme in the demands it makes on its players, but the over-all impression is poised and sure, sometimes ebullient and always carefully in balance. …well made, with contrasts and tensions to make it vital. In the Shapey work the piano duo totally captured the demoniac fervor of the indicated marking ‘wild, with energy’… After the furore subsided, a pleasant quite conventional open chordal section brought the work to a peaceful close. …it held the audience hypnotized as if at some primeval ritual. Shapey’s theatrical gestures seldom fail to work, and this piece proved no exception. Here, in effect, was your tough, bite-your-head-off, modern virtuoso concerto equipped with a big beating romantic heart underneath… A feisty business it was, and terse too, sagely leaving the audience asking for more. …the Shapey Discourse is made up of strong, jagged, hard-edged 20th-century materials. It is not pretty but it is very real and it has surprisingly tender moments. Shapey’s Double Concerto is a thoroughly characteristic work of three movements… its constant rude vigor and febrile life-force elbow their way into one’s consciousness with a visceral power akin to that of Ruggles. Extremely striking… included Puckish humor and real tenderness along with a hieratic Kabuki sort of gripping, self-righteous tension. The virtuosic writing for violin cast the instrument in varying roles, but sketched a picture of a contemporary hero – full of conflicts and darkness, but true to itself. …[Evocation No. 2] sounded almost like an American Messiaen, but with an exactitude of aural color and a lack of self-indulgence that the Frenchman does not always equal. Shapey chisels the music from rock and then walks around it, examining it from all angles, light and shadow slanting in from every direction. …vigorous, strong-limbed and …authentic. The first two sections, a passacaglia and a scherzo, adhere to the composer’s craggy, atonal manner… The third section…with its long-breathed lyricism, belies Shapey’s image as an angry purveyor of gnarled abstract-expressionism. …Ralph Shapey’s Fromm Variations stands out with a stylistic purity and rugged intensity that is so typical of this uncompromising composer. [Fromm Variations] will doubtless find a place in the repertoire if pianists only accept its formidable challenge, so rich is its expressive content and so well-developed are its characterizations. What impresses immediately is that this is music in which every note, and its placement within its chord, is clearly intended to be heard. Ralph Shapey’s piece is a chilling affair, with the soprano singing – or rather vocalizing – syllables that don’t make words over a terrifying range of long intervals. …The music has an inescapable hold on the listener. Shapey creates and sustains remarkable tension throughout the piece, mainly because his language is uninhibited but never undisciplined. Incantations deserves another hearing. Hallucinatory night music… increasingly appears as one of the great works of the postwar period. Craggy and pungently atonal, the music moves in fitful spurts of astringently dissonant yet captivating harmony with strangely wide-spaced chords. I especially love the third movement, where the instruments break into obstinate bouts of counterpoint. …the most important of the first performances. Real words are used for the text, broken up in unusual patterns, so that the meaning is conveyed in a half-abstract, half-verbal way. Its tough-skinned intellectual severity is mixed with a piquant wit and slightly cynical glimpses of sentiment… disorienting and slyly captivating, both in its fury and in its wry irony. it explores ultimate verities of musical language and meaning in a way that I find instantly compelling, even though some of its intricacies demand repeated hearing for full comprehension. …the strength and integrity of [Partita-Fantasia], suggests that it may wear well for many more decades to come. This 13-minute work promises to be a major contribution to the American contemporary piano literature. 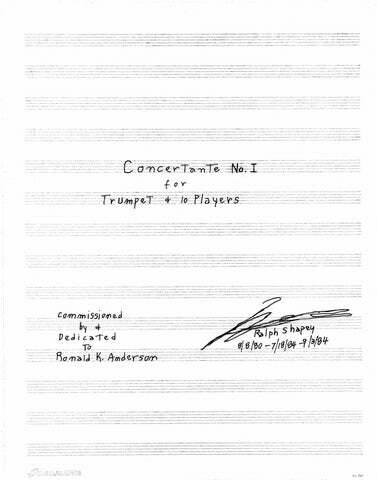 …Those looking for significant new works by American composers should check on this one. 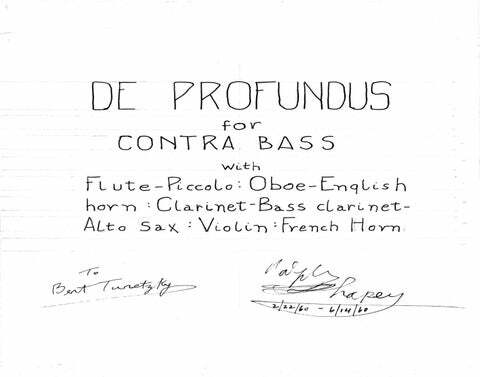 Ralph Shapey’s short concerto was the principal interest in this concert. It is an excellent piece of writing — the interest never lagged, the music was often exciting. Shapey is not to be fit into any fashion, but be remembered as one of the best – and greatest – of the romantic radicals. Perhaps only Beethoven stormed the heavens with such ferocity. When the Mount Rushmore of American composers is carved, Ralph Shapey will be right up there with the great originals like Ives and Ruggles; his music has comparable strength, individuality and integrity. Ralph Shapey’s Prelude and Scherzando (2001), was… less than four minutes long but tightly packed with rhythmically vital piano writing and wide-ranging cello themes. …an American masterpiece… a work of this scope demands live performance to be fully appreciated… the whole piece has a shape and focus that are continually impressive. …a work of violently expressive character. But beneath the jagged gestures, there is a lyricism that puts the music — for all its thoroughly contemporary harmonic language and motivic organization — firmly in the late-romantic tradition. Rituals is virile music as well as clamorous, a child of Varese’s influence, strong of spine and keen of ear. …interesting, even expressive from many viewpoints — coloristic, impressionistic, energetic, emotionally declamatory. …notable for its communicative rhythms, strong and logical sense of direction, and pleasing sonorities. These are direct, stark, gloomy and challenging songs and they deserve to take their place among the strongest soprano literature of our time. There is no mistaking this intense music as the product of anyone but Shapey; it holds your attention in an unrelenting grip. Ralph Shapey’s new work, Songs of Ecstasy, is a beauty. …it is intimate, deeply personal and therefore, immediate in appeal. The work is lean of materials and straightforward as stone. Sculpture and architecture are called to mind in reflecting on this fine work. Shapey… makes a powerful impression within a general post-Webern style orientation. His music is vital, probing, passionate and communicative – characteristics of all important music. This is a piece composed of melodic and harmonic fragments which are alternately elaborated on or reduced to their bare essentials. These units are manipulated in a most ingenious manner, yielding some remarkable sonorities. …wonderfully melodious 35-minute quartet. Moving in and out of an uneasy tonality, it relies on such time-honored devices as ostinato and complex chordal patterns to construct a classically proportioned statement of breathtaking beauty. Though Three for Six was in a style usually considered inaccessible, its form and intentions were, as usual for Shapey, remarkably clear. …a truly electric composition, and the most thrilling new work I’d heard in several moons. …Bravo Shapey! This piece turned to be more immediately inviting than many Shapey scores. Mr. Shapey’s gritty harmonic idiom sounds very impressive when intoned by the grand sustaining power of an organ. But it is the overtly Romantic, heaven-storming side of his personality that suits the pipe organ particularly well. The theme that undergoes the variations is in itself atonally and dissonantly heroic, but its progress implies a destination within a tonality and a harmonic scheme tantalizingly near consonance. Ralph Shapey’s Variations for Viola and 9 Players… was the most anticipated piece of the evening, as well as the most persuasive… it is immediately compelling – packed with ideas and bristling with melodic and rhythmic invention.